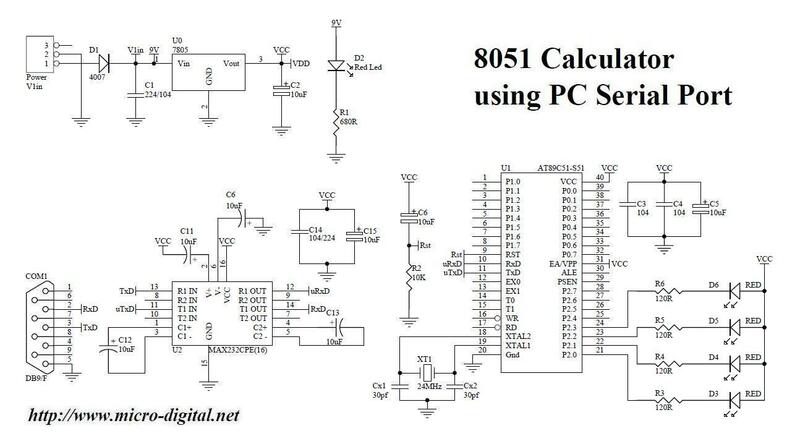 It’s an example of 8051 Calculator using PC Serial Port. This example shows that how can we use PC screen for display and PC keyboard for user input to our 8051 microcontroller. At PC side we use a terminal software like hyperterminal that displays data coming from microcontroller and sends key strokes read to microcontroller. So this makes easy for a new programmer to display and read input from user without interfacing any LCD, seven segment or keypad. This example also shows that how can we configure and use serial channel of 8051 microcontroller for sending and receiving data to PC. In so many projects we need to share data or information to other devices. Now user enters 2nd number for example 234 and presses enter. Finally microcontroller shows answer and asks user to press any key for next calculation. This is an interesting example in which we learn how can we configure 8051 serial channel, use PC monitor for microcontroller display and PC keyboard as keyboard attached to microcontroller.